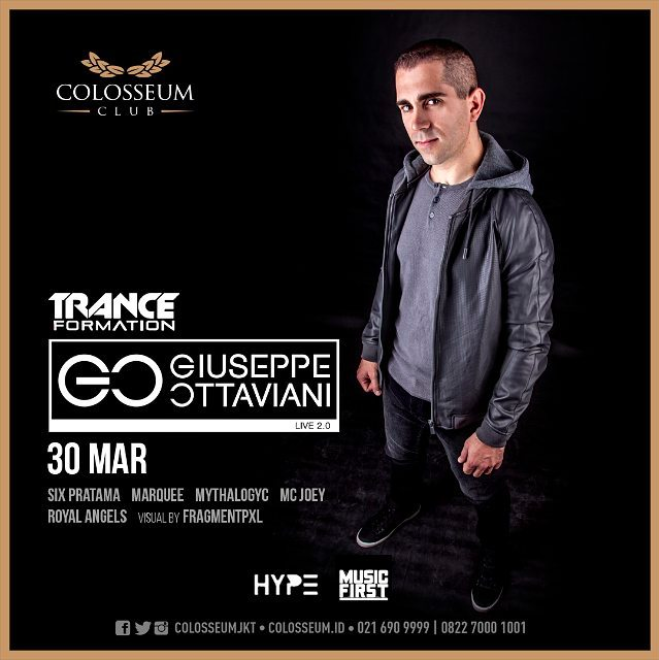 Get your squad ready and #LetsGetExcited for the anticipated return of musical genius and famed #trance artist @giuseppeottaviani at Colosseum Jakarta on Friday, 30th March 2018! Giuseppe Ottaviani has started to release tracks on VANDIT Records, Paul Van Dyk’s renowned label, in 2001 and since then can be considered one of the most talented producer and influential recording artist in trance music. His musical career started at the age of 4 years in Viterbo, a small Italian town near Rome when he first started to play the piano. After music school in his early childhood and studies of classical music as a teen, he discovered electronic music and started to spin his first DJ-sets at clubs and on local radio stations. His deep enthusiasm for anything related to technology led to him beginning to use his computer to make and produce his own music and when he met Andrea Ribeca in 1999 (an electronic music enthusiast and also DJ) both quickly decided to start their own music project: NU NRG - Giuseppe’s starting point as a professional musician and producer. Since that time Giuseppe Ottaviani released club anthems like Dreamland, the Spaceflower EP, Butterfly, Casino Connected and the smash hit Free Fall and won numerous awards like the Trance Award in 2004, 2006 and 2007 for Best Live Act. No wonder why he is playing on the biggest Festivals and greatest events while touring all over the world. Since 2005 Giuseppe Ottaviani has started his solo career with big success. His solo-productions like Through Your Eyes or his compilation The VANDIT Sessions 4 receive an outstanding feedback from all around the globe. The tracks La Dolce Vita and Far Away on Paul van Dyks album In Between again show his quality as one of the most creative artists in this scene. He also keeps on performing live with more enthusiasm as ever before: “Playing my own music live is something special, something that really touches me” Giuseppe says, “it is an electronic music concert, performing on stage allows you to get through to the people, they really breathe the music, you can establish a two-way bond with them and the music itself changes and reacts to the people, this is why each show is different, unique”. What ever is next for Giuseppe Ottaviani, it will be big!